So as promised, here is another preset for Thinking Particles. This is from the old HYPA archive that I am slowly resurrecting. I told you I’d get them online eventually, my apologies that it is taking some time! I’ve been pretty busy lately with projects and some new training, but more about that later. On with the particle goodness! This preset uses the P_MotionInheritance node. It also covers a few other TP / Xpresso tricks. The particles are emitted and they take on a cone shape. The cone shape is forced to point in the direction of travel using the PAlignment node. PGravity and PScale are used to… well give the particles gravity (upwards via some spherical gravity) and affect their scale. The PBubble node gives the particles a little deviation from their paths as they move along. The top few nodes use PData to obtain the particle position, this is then compared with the Y position of a null object. Once the particles are above this null, they are moved from the Start group into the End group. Once the particles are moved from the Start group into the End group the second set of Xpresso takes over. 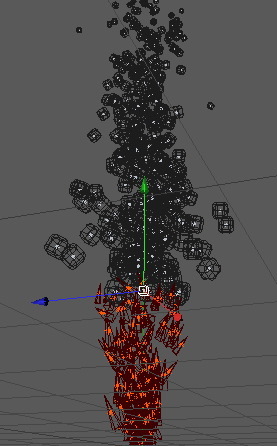 This is fairly simple, firstly the particles change shape to become cubes. They also scale down using the PScale node. The PMotionInheritance node is used here. Basically there is a null object in the scene that is rotating around. This is then referenced by the PMotionInheritance node and the motion is applied to the particles. This makes the cubes swirl around as they rise up. Here’s a quicktime movie that shows a render of the result. 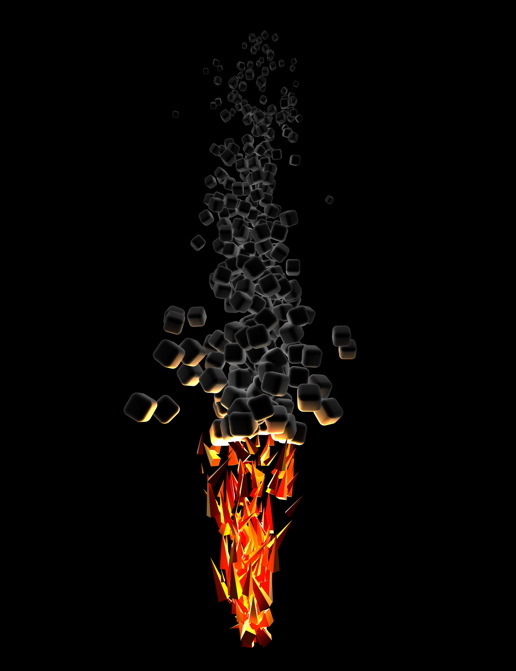 I used GI for the render and you can see that the ‘fire’ is the main source for illumination. Of course there are a lot more creative uses for this technique, but hopefully this simple example is enough to spark your creative juices and encourage you to play more with those lovely Thinking Particles! You can download the scene file here. It is saved with r11.5, but I’m sure it will be ok with r11 and r12 too. Can you explain you remitter setup? What’s the purpose of the TP surface emitter? Why choose any one emitter over the other? (PBorn vs PStorm) What do the SurfacePosition and SetData nodes mean? I love your tutorials, they are very professional.